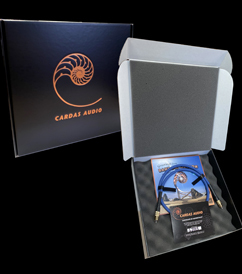 As has been the case with the history of Cardas packaging, the correct packaging ensures that you have purchased genuine Cardas product from an authorized dealer or distributor. 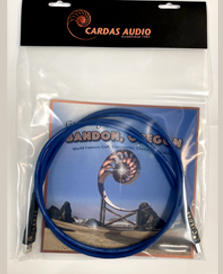 New Cardas cables, purchased from an authorized Cardas dealer or distributor, will come with the correct Cardas packaging. We currently have three levels of packaging. Description: 12" x 12" x 2.5" soft touch box with embossed copper Nautilus on the front, and product information checkboxes on the right side. The cable is coiled in a plastic bag along with its Certficiate of Authenticity, and placed in an inner-box. The inner box slides into the outer box. A label indicating the cable model is adhered to the right side, under the column of checkboxes. Cables packaged this way: All Clear cables, with the exception of Clear USB, Clear Headphone, and Clear Light Headphone. Golden Cross Speaker, Cross Speaker, and Cross Interconnect. Cables packaged this way: Clear USB, Clear Headphone, Clear Light Headphone, Parsec, Quadlink, Microtwin, Twinlink, Crosslink, Lightning, High Speed Data, Cardas HDMI. Description: 5 inch wide cardboard foldover with Cardas name & logo on front, and product information checkboxes on the back. Staples to a 5" wide bag holding the product. Products packaged this way: Personal Audio Interconnects, Headphone Interconnect (HPI), adaptors, bi-wire jumpers, RCA/XLR caps, Myrtle Blocks, Multi Blocks, USB music card, Phono Interface Boxes, all other Cardas accessories intended for retail customers. 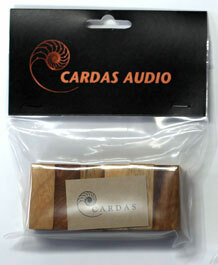 Curious about classic Cardas packaging? Click here for a look at an old-school Cardas insert & break-in guide.